As the waves of Henrygate reverberate around the web it’s time to sit back and look at what’s actually happening here. The principal clamour from fans appears to be in the direction of staging a one-off replay of the game. Giovanni Trappatoni in his press conference this afternoon ruled out the replay idea as “impossible”, but that hasn’t stopped the FAI from launching an official complaint with FIFA. There is some merit to the notion of a replay as one has been sanctioned before. FIFA sanctioned a replay of the Uzbekistan-Bahrain after ruling that the referee erred in the first leg by disallowing a penalty scored by Uzbekistan’s Server Djeparov in the September 3rd, 2005 match because defender Timur Kapadze invaded the box before the penalty was taken. In this instance however all the pleading in the world is unlikely to make FIFA sanction a replay. It’s just not in their interest. France are one of the largest footballing nations in the world. Ireland aren’t. Neither were Uzbekistan or Bahrain. Not having a team the calibre of France in the World Cup would diminish the contest from an advertising stand-point and Ireland, no matter how enthusiastic our supporters are, are not going to make up that revenue stream. In the end it all comes down to money and the World Cup is principally a business first and a competition second. The draw in Paris is said to have cost the Irish economy millions and that is easy to see. World Cup fever encourages people to spend, to go out to pubs to buy merchandise, flags etc. When England failed to qualify for Euro 2008 Sports Direct, Britain’s largest sports retailer, was forced to issue a profit warning. Football is that big a business. Yes Ireland were cheated out of a chance to go to South Africa, but it was a chance only. There were still 15 minutes to play before the lottery of a penalty shoot-out would have begun. We cannot know what would have happened in those 15 minutes and it is pointless to speculate. What we need to do as individuals and as a nation is rally behind our team, support them and congratulate them. They’ve done us proud and no-one, not even Monsieur Henry can take that away from us. Henry had his chance last night to become one of the greats in the modern game and admit to the referee that he handled the ball. Instead he did what most of us would do in his situation and let things be. The biggest problem that I have with Henry’s actions was not the handball or cover-up. It was the excessive celebrations and mile-wide grin that accompanied them. He knew he’d done wrong, his conversation with a dejected Richard Dunne at the end of the game said as much, but yet he celebrated wildly. It sends a dangerous precedent which flies in the eye of the saying “cheaters never prosper”. France cheated and now they’re going to the World Cup. The saddest thing about all of it was something a friend said to me this morning. 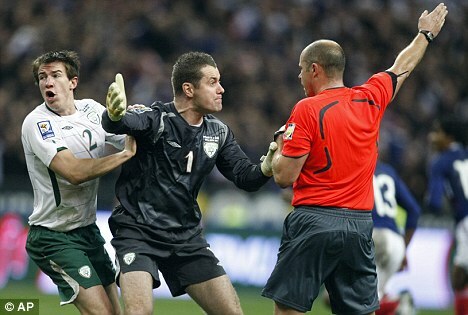 His 10 year-old son was watching the game with him and afterwards asked his father why Ireland didn’t cheat too. His father told him that it was because Ireland were the good guys and that cheating was wrong. His son then told him yes but France cheated and they won. Henry who is a huge role model to kids these days has just told an entire generation that it’s okay to cheat as long as you win. Last night in the wake of Ireland’s cruel exit from World Cup 2010 at the hands of the French I wanted to express my feelings. A combination of tiredness and wisdom told me to wait until the morning and approach the subject with a clear head.